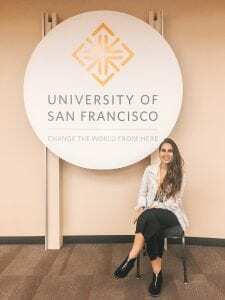 I’m from Brazil and I have just moved here to San Francisco, so this is my first semester in the MAPC program. I have a bachelor degree in Social Communication, with the emphasis in Advertising and Propaganda. After my graduation, in 2016, I started to work for an agency as a press officer and public relations of events, artists and musicians. I really loved my job, but my dream to pursue an international master’s degree – and, of course, the unique experience to study abroad – encouraged me to apply for this program. I have always loved to be surrounded by people and their endless, diverse and interesting stories, and I believe that’s why I’ve chosen Communication as my professional path. I love music in its most diverse genres. I’ve grown up listening to and playing classical music on the piano but I also enjoy popular types of music. My last job, as I described above, additionally introduced me to diverse ways of cultural representation through music.